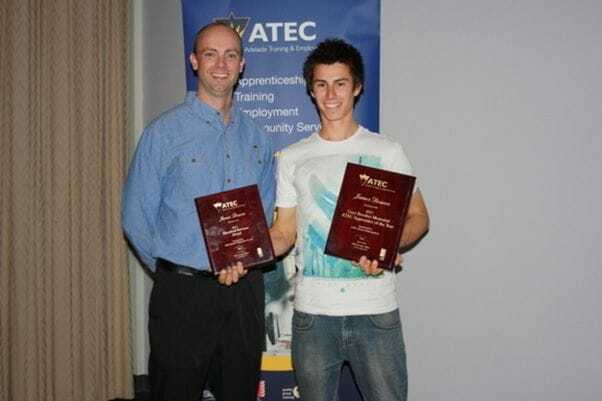 A great example of ATEC’s success in matching and hiring out the right candidate to meet the exact needs of business is the winner of the RTO’s Apprentice of the Year – Jamie Douros, an electrical apprentice who was hired out to Whittle Electrical Services for his entire apprenticeship won the award over 500 other apprentices and trainees. Jamie’s journey into the trades started at Lonsdale where he enrolled as a jobseeker into a certificate 2 in Electro technology and was employed from that course by ATEC Group Training. Jamie has been with the one host employer, Whittle Electrical Services since day one and they have asked Jamie if he could stay with them after completing his apprenticeship. Jamie said he could not picture himself at Uni or becoming a desk jockey. He comes from a family with an electrical background and he has commented that’s what “sparked” his interest in electrical. Jamie enjoys dealing with customers and hopes to start his own business and eventually take on his own apprentices through ATEC Group Training. ATEC Group Training congratulate Jamie on his achievements!